TIP: To create an extra juicy turkey breast, take an additional 2 tbsp of softened butter and spread generously under the skin and all over the breast before cooking. Defrost the turkey according to package instructions or visit canadianturkey.ca/ for proper thawing instructions and tips. Make sure the giblets have been removed. 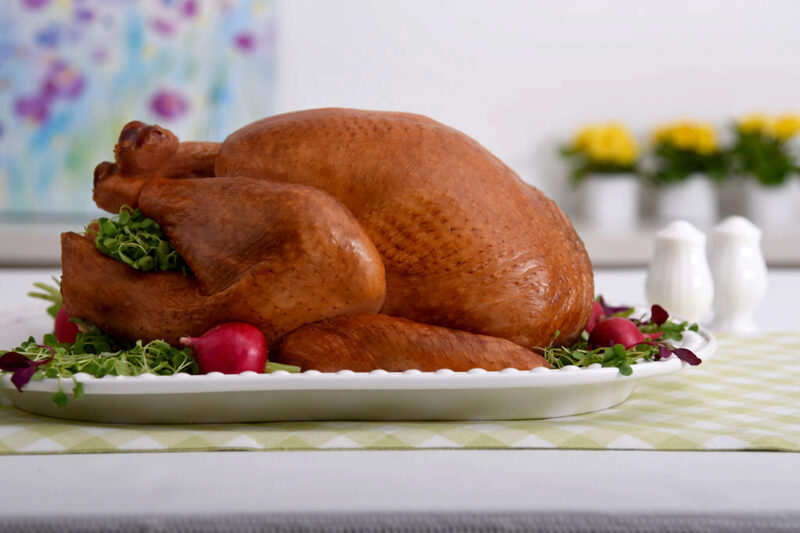 At least 12, and up to 24 hours before cooking, air-chill your turkey in the refrigerator. Air chilling will dry out the skin of the bird, making the skin extra crispy when cooked. 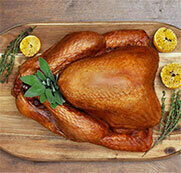 To air chill your turkey, place the bird on a baking sheet or baking pan large enough to hold the bird. Make sure the pan is deep enough to catch any drips or liquid. Place the turkey on a baking rack in the pan, so that air can circulate completely around the bird. Preheat your oven to 350ºF (175ºC). Once the turkey is ready to roast, spread the butter evenly over the breast. Season the bird, inside and out, with the salt, pepper, olive oil and the herbs. Stuff the cavity with the celery, carrots and onions. Place the turkey in a large roasting pan. Roast for 3 ½ - 4 ½ hours or until the juices run clear and an instant thermometer reads 170°F (77°C) in the breast and 180°F (82°C) in the thigh when inserted into the thickest part of the meat. For more information on cooking times, visit canadianturley.ca. Remove the turkey from the oven and let it rest for 30 minutes. Discard vegetables from the cavity and carve the turkey.